On July 7 2006 Big Up Radio sat down with Dave “Ras D” Munroe to discuss his Cd “Give Some Love Today”, upcoming performances, studio projects, and his new Cd. “Love with Meaning” due out in early 2007. When asked when he first had an interest in music Ras D replied “from birth”. That seems to be a common answer among musicians hailing from Jamaica. 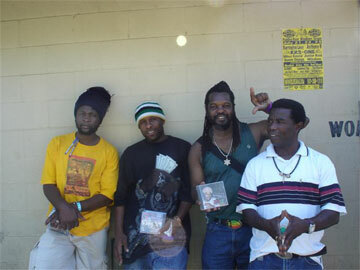 Music for Jamaicans is an integral part of daily life , and Ras D is no exception. Growing up in Kingston Ras D formed an early friendship with Andrew Tosh, son of the legendary founding wailer, Peter Tosh. He recalled days spent at the Tosh family home, where surely some of his first musical influences began. While going to school together Ras D and Andrew Tosh got involved in music class, although he states he didn’t get the idea to become a singer, songwriter and musician until later. Beginning in 1996 Ras D had linked up with Flourgon a.k.a. Michael May, along with his brother Red Dragon. Flourgon utilized Ras D’s lyrical talent for material for his own music. Songs like “Too Early Shirley” on the Fat Eyes label, and “Lasco”on Sly and Robbie’s Taxi label, were written By Ras D for Flourgon. The latter eventually was used in a television commercial. After “Lasco” received air play in Jamaica and oversees they met with the owner and President of Lasco( a soy based nutritional drink), Mr. Lasco himself. The end result was a television commercial featuring Ras D’s and Flourgon’s “Lasco” . In July of 1999 Ras D left Jamaica for the United States of America, and went on tour with Andrew Tosh, Junior Reid, and Michael Rose. Touring for two months across the country, is where he realized his destiny to become a singer as well as songwriter. Ras D, decided to stay in the states after the tour concluded, and began working on songs for what would be his debut Cd “Give Some Love Today” which was released in 2004. “The message is vital” explains Ras D. “I wanted to focus on serious topics of the times.” He certainly does with tracks like “Sept.11th”, “It’s a Dirty Habit”, and “After the Storm” with Junior Toots. and the title track “Give Some Love Today” with vocals from Regina Espinoza. The lyrics are heartical and pure wisdom. Ras D has a real talent of putting emotion to lyrics, and the listener is uplifted with songs of thanks and praise like “Hail the King”, and “Peace Call”. Righteous lyrics throughout, with other songs such as “Education”, and “The Herb” pointing out the many benefits, of the blessed colly tree. Ras D has been hard at work finishing his second album, “Love with Meaning”, due out in early 2007. We at Big Up Radio were treated to an acapella version of the title track “Love with Meaning.” As a serious musician and vocalist Ras D is mastering his new work now, and putting the finishing touches on the last few songs to be put on the new Cd. I am blessed to be one of the few people to hear his latest works. Let me tell you, the vibes are nice. As with all of Ras D’s music, inspiration comes directly from His Imperial Majesty, Emperor Haile Selassie I. His songs include messages of truth and rights, songs of love for the woman, and for humanity world wide. Check Out Ras D’s video on www.bigupradio.com. You can purchase his Cd from www.bigupradio.com. To contact Ras D for bookings you can send an email to daverasd@hotmail.com. If you have the opportunity to see a live performance from Ras D, don’t miss it. I was impressed with his stage performance at Dreadstock, in Vallejo California. I hope he returns again this fall! To keep up to date check out the events page on his website. Ras D’s message is itinual, and his positive vibes just nice up the place.